The Chinese housing slowdown is worrying investors. The number of cities reporting increased new home prices in April was the lowest in 18 months, as developers started offering serious discounts and GDP growth slowed down. In April, out of 70 cities, the Bureau of National Statistics reported that 40 reported new home price increases, compared to 56 in March. April’s figures were the worst since October 2012 when just 35 cities reported price rises. 18 cities: remained the same. The highest increase in new homes month-on-month was 0.4%, while the lowest was a decline of -0.7%. China’s new home price rise slowed to 11-month low in April. The city with the highest increase reported +13.6%, and the weakest city a decline of -4.4%. Chinese authorities have been trying to cool the housing market for the last four years. It has worked, and construction activity has slowed down and is starting to drag on GDP growth, which expanded by 7.4% (annualized) in the first quarter of 2014 compared to 7.7% in the previous quarter. The People’s Bank of China, the country’s central bank, called on the country’s major lenders to speed up the granting of mortgages. Several developers, such as Greentown China Holdings Ltd. and China Vanke Co. are cutting prices to attract homebuyers. 13 cities: remained the same. The largest month-on-month gain was 0.7%, while the lowest was (minus) -0.8%. 1 city: remained the same. The largest year-on-year increase was 12%, while the lowest was (minus) -8.3%. House price growth slowed down overall in most cities, especially the less affluent ones. Beijing saw April prices rise by just 0.1% compared to March, the smallest increase since September 2012, while Shanghai’s 0.3% was the slowest since November 2012. In Hangzhou, eastern China, prices declined by 0.7%. The average Beijing citizen has to save for 13 years just to accumulated enough for a down payment for a small apartment. China’s capital is marked as one of the “red zones” in an unofficial map indicating how much home buyers suffer across the country, according to Xinhua. 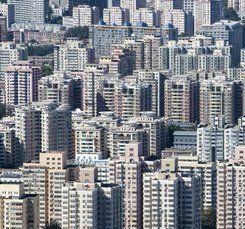 Residents of “red zone” cities have to save for at least nine years – without spending a penny on food – to cover the down payment for an 80-square meter apartment. The down payment represents approximately 30% of the property price.